'Tis the season for debris updates! This week has had a number of events and news stories that are worth mentioning, so I'll go ahead and share those with you today. Let's head over to Hawaii for the first two news items. It seems that, in agreement with NOAA modeling, a fair amount of debris is hitting the Aloha State. The state has been preparing for a number of months for the impending debris, and it seems that those preparations were worth it. The first item of interest was the most publicized, but perhaps not the most interesting. 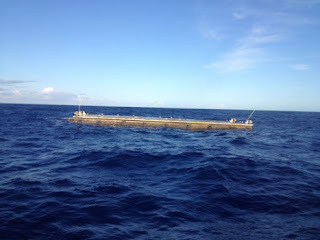 On Friday, September 21st, a very large blue plastic bin reached the shore of Oahu. 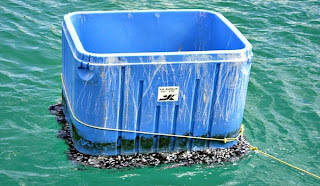 Fortunately, although mussels typical of Hawaii were growing along the bottom, the bin didn't appear to have any Japanese species on it, so it was much less a biological hazard than some other debris that has drifted. 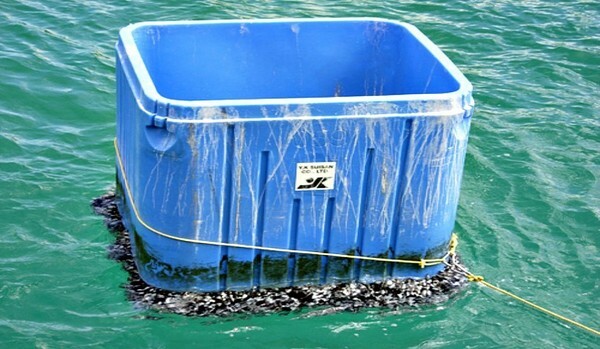 The bin is roughly four feet by four feet, and is typical for one used to transport seafood. NOAA says that even though the bin arrived just as scheduled by models, there is still a degree of uncertainty and it could have just been a coincidence. Surprisingly, the must more interesting piece of news was less publicized until today. It seems that in addition to the giant blue plastic tub, the mysterious third dock from Honshu (see my previous post here for detailed information) has appeared near Hawaii. This means that three out of four of the giant floating docks have been accounted for- there is still one out there. Much to many scientists' dismay, despite several sightings (and even a video of a fisherman walking on it) NOAA and the State of Hawaii failed to initially tag or track the object as it drifted along. Therefore, the dock is currently MIA and the State of Hawaii is working to relocate it in an effort to possibly intersect or place a GPS device on it. I guess hindsight is 20/20. A helicopter was sent into the air this week to try and relocate it, with no luck. 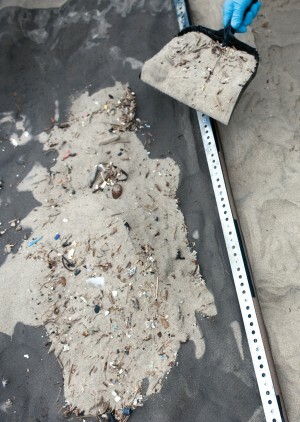 However, large amounts of styrofoam were found floating, as well as a ball of fishing debris. Stay tuned to see what else washes up on the shores of Hawaii in the next few weeks- it is sure to be quite active. HawaiiNewsNow is also a great site to watch. On September 22nd, more than 4,000 Oregonians hit their local beaches in an effort to rid them of trash. SOLVE (Stop Oregon Litter and Vandalism) hosted their annual Beach and Riverside cleanup, in which oregon coasters could choose from a number of their favorite local beaches to help clean up. Volunteers showed up, were supplied with gloves from the Oregon State Lottery, and bags provided by SOLVe. Over 51,600 pounds of trash were collected, both from local sources and tsunami debris. Your author was happy to volunteer, especially in what to proved to be an especially nice weather day. I worked at Lost Creek State Park. 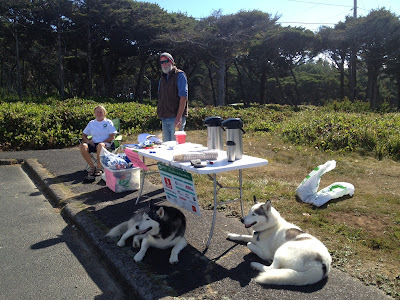 I was greeted by friendly volunteers and a very welcoming volunteer environment. I found mounds of plastic and styrofoam, as well as a variety of trash items. These cleanups will be increasingly important when more debris hits shores, as the state will not have the money to pay for repeated cleanups. Volunteers will certainly be the front line in keeping our beloved beaches clean. Because of tsunami debris, large amounts of styrofoam and plastic were collected. Both of these materials are highly hazardous to marine life, as they break down and can be swallowed by seabirds, marine mammals, and fish. Plastic continually breaks down into small 'nurdles' which work themselves into the sand. Styrofoam acts similarly, and does not biodegrade. SOLVe has also hosted 21 cleanups in the last three months to cope with tsunami debris, especially in heavily affected areas. Prior to Beach and Riverside cleanup day, over 39,000 pounds of trash have already been collected. SOLVe also hosts a number of beach cleanup 'stations' for citizens to pick up and dispose of bags of beach trash. For more information on SOLVe's cleanup stations, as well as how to become involved, check out their website for debris information and a calendar of events. Hatfield Marine Science Center's own John Chapman, PhD gave a presentation to an overflowing audience yesterday in the Guin Library on the species found on the Agate Beach dock. Chapman reported on the particular species found, methods used to collect, catalog, or destroy invasive species, as well as issues to look out for in the future. He highlighted the fact that upon deconstruction of the dock, even more animals were found in the hollow floats of the dock, as well as underneath. He expressed concerns that while beach surveys were heavily conducted to collect living organisms, no subtidal work was done at all. 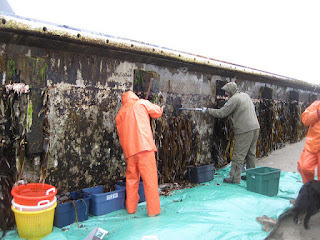 For such a unique and serendipitous event (the dock did land in the backyard of NOAA, Hatfield, and the NMFS), there were possibly several opportunities missed to collect as much information as was possible. However, with funding lacking for many organizations, it is likely that many more such opportunities will be missed, simply due to lack of money. Chapman also discussed the Hawaii dock a bit, and related how the lifecycles of organisms on debris could be used to better understand where most organisms originated, whether inshore Japan or mid-water.